Snow leopards are iconic, well-known animals. They’ve been the subject of numerous wildlife documentaries, and have been featured in countless works of fiction. They feature heavily in the symbology and heraldry of the Tatars and the Kazakhs, and there are any number of local myths and legends surrounding these stunning felines. There are only about three thousand snow leopards left in the wild, and the population is dwindling rapidly. In addition to their highly-prized fur, their organs are also used in some forms of traditional medicine – meaning that their hunting and poaching has yet to be eradicated, despite numerous laws in place that attempt to do just that. While they are the smallest of the big cats, snow leopards exhibit a wide range of shapes and sizes and come in weights from 25kg to 75kg. Their tails are extremely long in relation to their bodies, which are usually rather short when compared to the builds of other big cats. These highly developed tails serve many uses – everything from a blanket to protect the leopard’s face from the cold to an extra balancing aid when scaling steep and mountainous territory. Their most distinguishing feature, of course, is their beautiful coats. White or grey in colour, these coats are gorgeously dappled with the ‘open rosette’ style spots so emblematic of the leopard – and resulting, of course, in a horrifyingly prolific black market fur trade despite their classification as being Globally Endangered. These coats are soft and fluffy in the winter but much harsher and bristlier than might be expected during the warmer months. Their bodies are perfectly adapted for the cold, rocky environments to which they are indigenous. They have thick fur to keep out the cold, broad paws to walk on freshly-fallen snow with, a stocky build that minimises heat loss and large nostrils to help them breathe thin, cold air. This makes it difficult for them to survive in other habitats, but has been of great assistance to them in their native lands. These highly specialised animals can live in only a few types of habitat. They can be found in Afghanistan, Bhutan, China, India, Kazakhstan, Kyrgyzstan, Nepal, Pakistan, Russia, Tajikistan and Uzbekistan, and only in very specific parts of those countries. 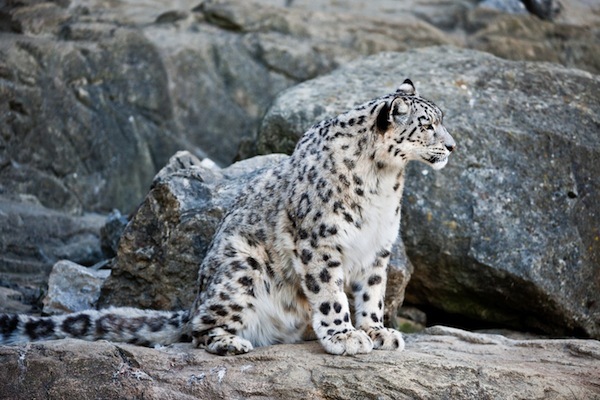 There are plenty of snow leopards kept in captivity, however, and re-introduction programmes are being considered by some animal conservation groups. They are thought to be most common in Siberia, where the freezing temperatures and jagged landscape fits their adaptations perfectly. Like most cats, snow leopards are both territorial and solitary. Unlike many, however, they don’t defend their territories all that fiercely – these home ranges may be of a huge variety of sizes, and these are not creatures who need to kill and eat in massively high volumes. They’re fairly secretive animals, and they remain extremely well-camouflaged in the wild. While snow leopards will eat any meat they can find – including carrion and domestic livestock – they primarily hunt for their own food. Their diets are varied and opportunistic; they’ll kill and eat everything from small rodents to large indigenous mammals of anything up to four times their own weight. Their preferred diet appears to consist of mountain goats and sheep, but they will predate upon anything that comes into their range. Unusually amongst cats, snow leopards consume a significant amount of vegetation to supplement their diet – they remain obligate carnivores who cannot survive long-term without meat, but they can subsist for some time on a diet of grass and twigs. This sets them apart from many felines, who by and large derive no nutritional value whatsoever from herbivorous foods. Unlike many large cats, who tend to breed year-round, snow leopards have a well-defined mating season. Generally speaking, they mate in late winter, gestate for between ninety and one hundred days, and give birth between April and June. By and large, neither males nor females will seek out a second partner once they have mated once. Litters usually contain about two or three cubs, who are heavily furred though blind and helpless. They open their eyes after once week, walk after five and are fully weaned by ten – though they often don’t leave their mother’s territory until almost two years have passed. Once they do, however, they sometimes walk for a long time before finally choosing a place to start a territory of their own – a practice which probably developed to help avoid inbreeding and keep the gene pool widely dispersed. Unusually, litters tend to be larger when the cats are bred in captivity. 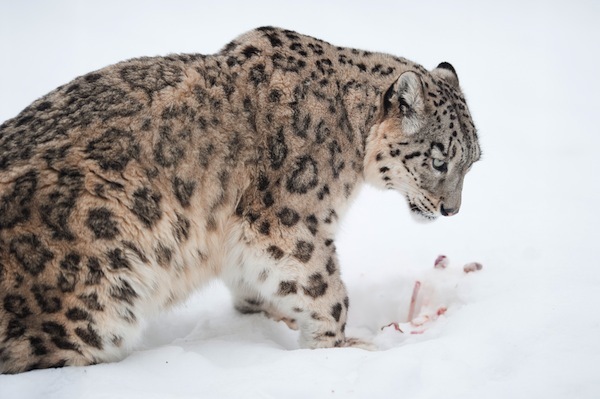 This quirk has made captive breeding programmes a great success, and it is likely that conservationists will be successful in their efforts to help the snow leopard survive as a species in the wild.